Hi there! Since you're here, we know that you want to find out more about who we are behind the scenes at The Painting Pony Studio & Gifts! 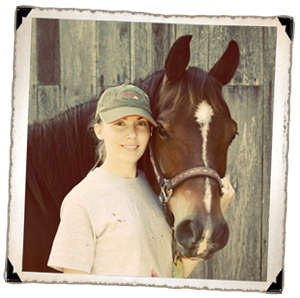 We are a hard-working team made up of a stay-at-home mom, Jessica, and her faithful pony sidekick, Buddy. 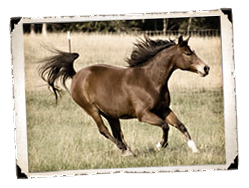 By shopping with us, you are helping to support a small, family-run business that strives to bring you quality products that are original and fun to the equestrian enthusiast. We also strive to offer mostly American-made products as we believe in supporting our fellow Americans! Read on to find out more about Jessica and Buddy. Jessica grew-up being a self-taught artist from the time she was a little girl with a love for horses. Her mother was also an accomplished artist and she helped Jessica's art mature as she drew horses obsessively throughout her childhood years. In college, Jessica took many different art classes involving different mediums from ceramics, to painting, and even photography. A love for photography launched her career into equestrian portraiture and then also wedding photography, which she loved capturing the beauty and emmotions in people's lives. Eventually, she found herself going back to her roots as an artist using more hands-on techniques and discovered a love for watercolor paints. Her art leans more towards realism than the abstract but she is always trying to widen her artistic scope by trying new techniques. Along the way of broadening her artistic skills, Jessica started to do graphic design work digitally on the computer. What started out as selling a few T-shirts alongside Buddy's paintings, turned into a larger-scale product offering through various print-on-demand websites. Eventually, her work grew to the point that it was possible to branch out on our own and source products ourselves to offer through our online catalog, bringing The Painting Pony Studio & Gifts to you as it is today! Buddy began life in Florida where he met Jessica when he was only three years old. She worked with the little half-arab pony for a year and when his owners decided to sell him, she bought him to finish his training. Jessica trained Buddy as a hunter. He attended several local schooling shows with Jessica where a young girl would ride him in walk-trot classes and Jessica would ride him in a Baby Greens class. Life was good and Buddy was progressing well. 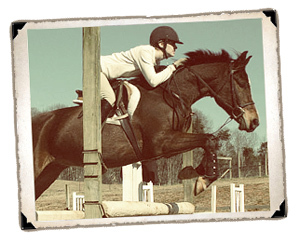 At 5 years of age, Buddy then moved to Tennessee to go to college with Jessica where he participated on the school's equestrian team for a time on the IHSA. At the age of nine, Buddy learned a new talent. One day Jessica was going through all the art supplies she had and decided that it would be fun to teach Buddy how to paint. Armed with a pen that clicked to open and close and some treats, Jessica started to teach Buddy to hold things in his mouth. She used a crop at first and Buddy would twirl the crop around in the air for her. He learned quick that he got a treat when he did that. She then got out a paint brush and canvas and let him "paint" with an empty brush on the canvas to see what he would do. Buddy immediately began to make brush strokes on the canvas. After this "experiement," Jessica decided it was time to try real paint and Buddy produced his first painting. He enjoyed the painting and would work himself into it. His technique consists of throwing the brush on the ground, which picks up gravel and dirt, and then painting with it. His paintings are often a "mixed media" as a result. He decides when he is done painting by simply not painting any longer. People began asking to purchase his paintings on a frenzy when they were shown off to friends and family, and so we built a website to make his art more available to a wider audience. Buddy has been a relatively healthy and happy pony his whole life with the exception of the occassional "accident prone" injury. When he moved to Tennessee, the climate change made him slow to shed out his winter coat. However, after four years of living in Tennessee and still having problems shedding out in the fourth year, Jessica decided to find out what was going on and ordered some blood work to be done. When the test results came back, it was with bad news. Buddy was diagnosed with Cushings Disease at the young age of nine. If it weren't for the slow shedding, no one would have guessed there was anything wrong with him at all. Once Buddy was diagnosed with Cushings, his paintings became a source to help fund treatment for his condition as Jessica was just out of college and the extra funds to pay for his medical bills were hard to come by at the time. In November of the same year, Buddy was found in his pasture having trouble moving. A spinal tap was performed and the presence of EPM, a nuerological disease that often results in a horse needing to be put down, was confirmed. Although Buddy has had a successful recovery from this disease after over a year of treatment, there will always be a chance for a relapse in the future. Because of this, Buddy has been retired from active riding and showing in an effort to keep stress to a minimum in his life and reduce the risk of the EPM returning. In the Spring of 2011, Buddy was able to be moved to live at home with Jessica at Providence Farm. He now enjoys his retirement while being able to be with Jessica all the time instead of being boarded away from home. We look forward to seeing many new paintings from Buddy now that he is at home finally and no longer boarding. Plans include building Buddy his own "studio" painting area on the farm. A percentage of the profits of his paintings, in the past, was donated to research for Equine Cushings with the remainder going towards his continued care, however, the research program was canceled and until a new one is found, 50% of the profits from his original paintings will now go towards missions organization, Global Infusion. The remainder will go towards Buddy's continued care. Ol' Painter! 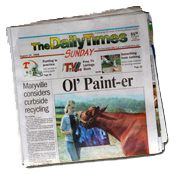 The Daily Times of Knoxville featured The Painting Pony on their Front Page! Hunter & Sport Horse Magazine features The Painting Pony in a Good News Spotlight! 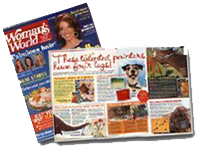 Women's World magazine features Buddy in "Animals that Paint."